You may remember from my April 17 post that I'm not much of a mechanic. Occasionally I test that immutable truth by digging out the wrenches (you never know, I may have supernaturally become a natural grease monkey in my sleep), but always discover that yes, I was not born to fix cars. 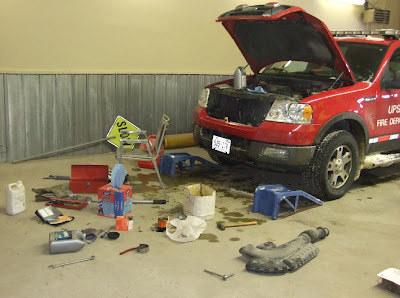 Today the mission was to change oil on fire department pickup truck. If I were most people, it would be a 15 or 20 minute task . . . but I'm not most people. The first time I tried changing oil in that truck it took about three hours, and I nearly had an apoplectic fit trying to wring the filter off the engine block. After numerous skinned knuckles and unmentionable comments about imbecilic vehicle designers that haven't got enough sense to attach a blasted filter someplace where you can reach it, I finally skewered it with a screwdriver (an old bushwacker trick) and wrung it off in a punctured, mangled mess. It looked like a corkscrew used for machine gun target practice, but at least it was off. Not long after that, I purchased one of those handy-dandy filter wrenches that you use with a socket wrench, which simplified life at oil change time . . . until today. I guess the ultimate graphite construction was only ultimate for a limited number of oil changes. The wrench kept slipping off, and I could feel the apoplexy coming on, but I tried one last angle and managed to break the filter free without losing a finger or my temper. Time for a new wrench . . . maybe ultimate aluminum this time. 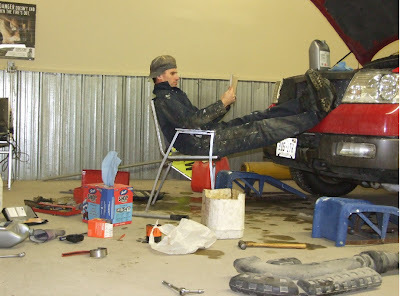 A real mechanic could have done a complete overhaul and only made half that mess. And this is me looking through the owner's manual trying to figure out where the dipstick is to make sure I didn't overfill it. No, I'm not kidding, and yes, that's a piece of the engine laying there . . . I had to take it off to get a different angle on the filter. On a more somber note, a Wisconsin firefighter died fighting a dumpster fire yesterday. You can read the story and see a photo of the scene here. No one expects to die at a fire, especially not a dumpster fire. An ugly reminder that we all need to stay on our toes all the time. On a happier note, the weather has gotten a little milder again, a bonus for everyone except the polar bears. -30 and -40 degree weather is to be expected this time of year, but when there isn't a lot of snow on the ground (like this year) it causes problems. Frozen pipes aren't a firefighter's problem . . . unless they're his or her pipes OR unless the owner tries to thaw them out with a propane torch and catches his house on fire. Then we get called to do our arctic fire attack maneuvers, and the problems begin . . . did I say I was thankful that the weather was a little milder? In case I don't get back at the keyboard for a couple days, Happy New Year to all! If you are a firefighter, may you stay safe and warm (but not too warm) in 2010.